Kingston Kitchen was crawling with people when I arrived a little after 8pm last Saturday at Hope Gardens. As I walked in I was happy to see one of my favourites, Stush in the Bush to my left, so that was my first stop. An Avocado Green Goddess Dressing immediately caught my eyes. Avocado and Guacamole are very popular right now. As a result, they were totally out of product and it was still early. A sample bottle was left. I got to taste it with a cracker and it was lovely. Now this Avocado dressing is quite versatile. You can use it on your burgers and Lisa Binns of Stush in the Bush even advised it is lovely on pasta with a sprinkle of parmesan. Yum! Remember their products are located at CPJ Market on Lady Musgrave Road. Moving along, I was greeted by a Suga Bear who told me that Suzanne Couch‘s food was a winner. I found a long line nearby. It wasn’t clear that it was her tent because she needed a bigger sign, but clearly word spread fast especially since she has a reputation for good quality food. Her meal was $800JMD including 2 meats (choices were Panko Fish, Sate Chicken Skewers and Pork), Oriental Cucumber salad, Coconut rice, Jerk Corn and Pasta Alfredo. Not to mention the variety of sauces offered such as Mango Chutney, Pineapple Salsa and Peanut Sauce. The picture featured does not do the quality of the meal justice as presentation was sloppy with everything piled on each other. But that heap of rice actually covered a good portion of my pork. The Pork was quite fatty but everything else was delicious. The Pasta Alfredo was spicy, so the Cucumber salad was a great choice to quell that heat. Other highlights and observations? 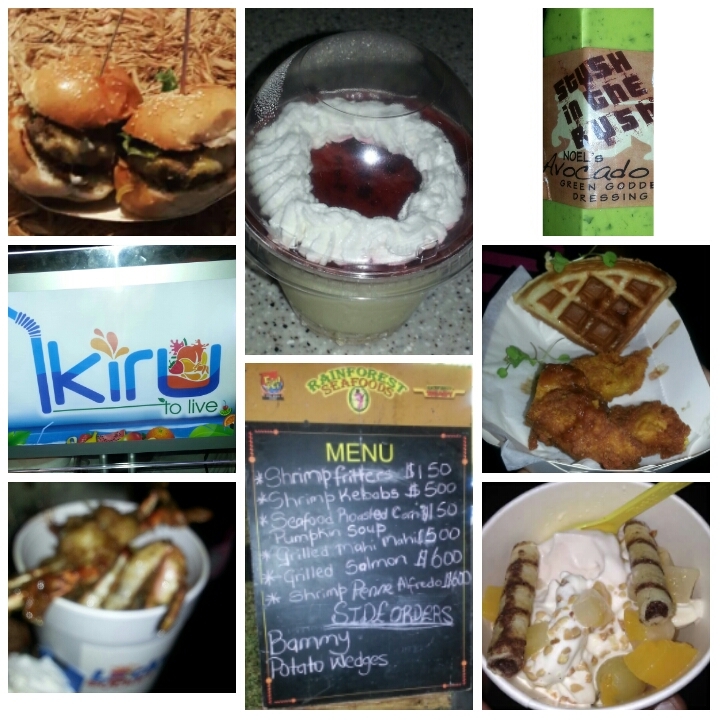 Persons got lucky with salivating Chicken and Waffles and the Lucky Bucket overflowing with extremely peppery Seafood and more such as Crab, Lobster legs, Louisiana Sausage, Corn, Potatoes etc. The Lucky Bucket that usually costs $1500JMD incl. Tax and Service Charge was just $800JMD for the night. What a deal! Both can be found at the Lucky Strike Lounge inside the Jamzone Bowling Alley in Manor Centre, Kingston 8 on Wednesday nights from 7pm-11pm. Liqy Liqy and Tutti Frutti pleased as usual. The Best Dressed Chicken Tent with Chef Brian Lumley had its familiar fans to see the Celebrity Chef at work and of course to taste what he had to offer. Apparently the Oxtail Wontons and Oxtail Pasta were a hit. Anything Chef Brian Lumley tends to do with Oxtail is perfection. Reggae Jammin had delicious White Chocolate Smoothies and I also satisfied my craving for Magic Mint Lemonade from Tea Tree Creperie. On point! The Ribs from Sheriff’s BBQ was not all that, also quite tough, but Lamb from NCR Sheep ‘sell off’! Literally. Sliders from Fromage Gourmet Market were a hit as expected. Potato Pudding that was $150JMD a slice from Del & Dutchy touched the right spot. They cater, specialising in Jamaican dishes and operate out of Liguanea, Kingston 6. Looks like they are worth a try so call 876-833-0727 or email delndutchy@gmail.com for more information. New Kids on the block, Ikiru, do not have a location yet but they are on Facebook. Persons who were in need of a refreshing drink with no added sugar and preservatives were pleased with their natural Naseberry and Papaya juices. They also had Fruit salads and Fruits with Yoghurt. Pebble’s Pastries was there. Most of us know that the only thing good from them is their Cheesecake but Suga found Cheesecake on the other side of Kingston Kitchen too! 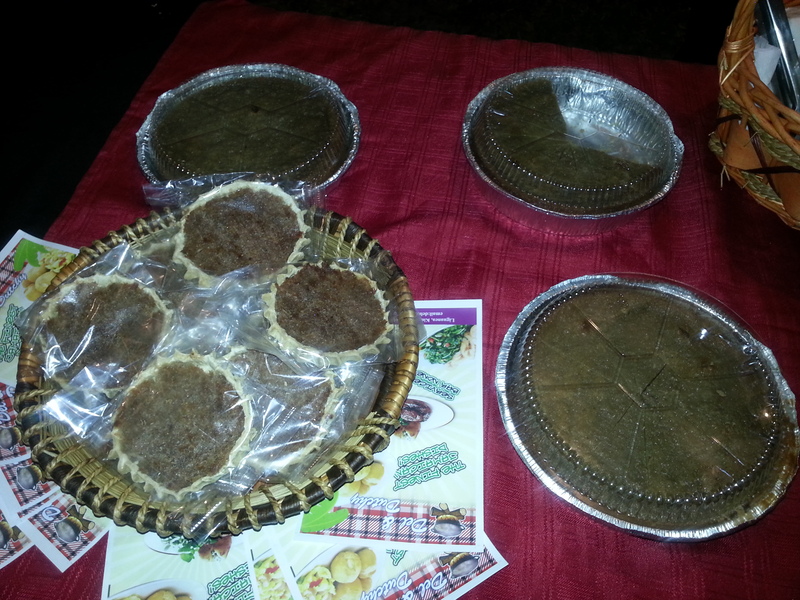 It was from Sweet World Enterprise that operates out of Portmore, featuring Molly’s Cake Cups with Cheesecake in many different forms such as Oreo cheesecake, Red velvet cheesecake, the traditional Strawberry cheesecake and the list goes on for $600JMD each. Samples were given (God bless them!) and a hard decision was made between the Oreo Cheesecake and Strawberry Cheesecake. The narrow edge went to the Strawberry Cheesecake. It was divine. Not sure if they had cute little bags to put them in, but they were not offered so a lot of persons had to remember to come back to them and pick up before they left if they were too full like myself to have that on the spot. 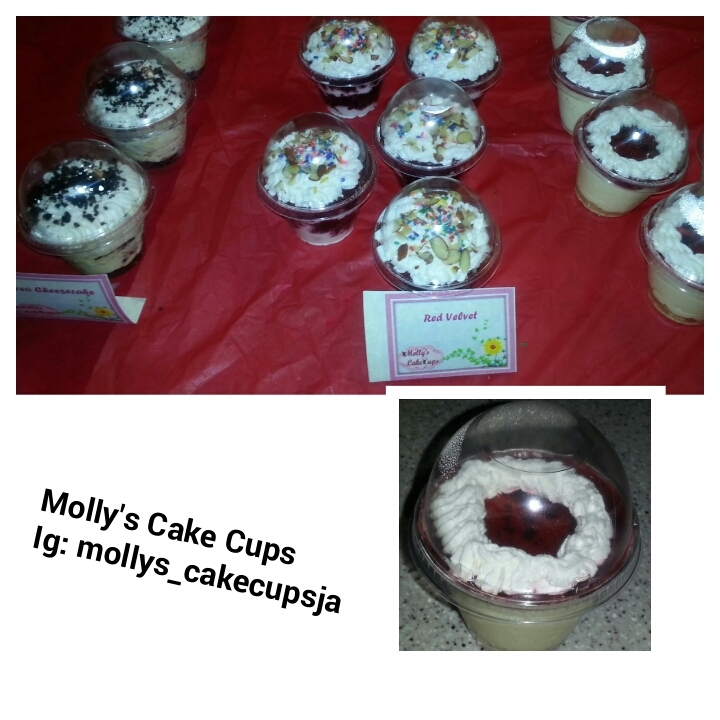 Check out Molly’s Cake Cups on Facebook and Instagram. 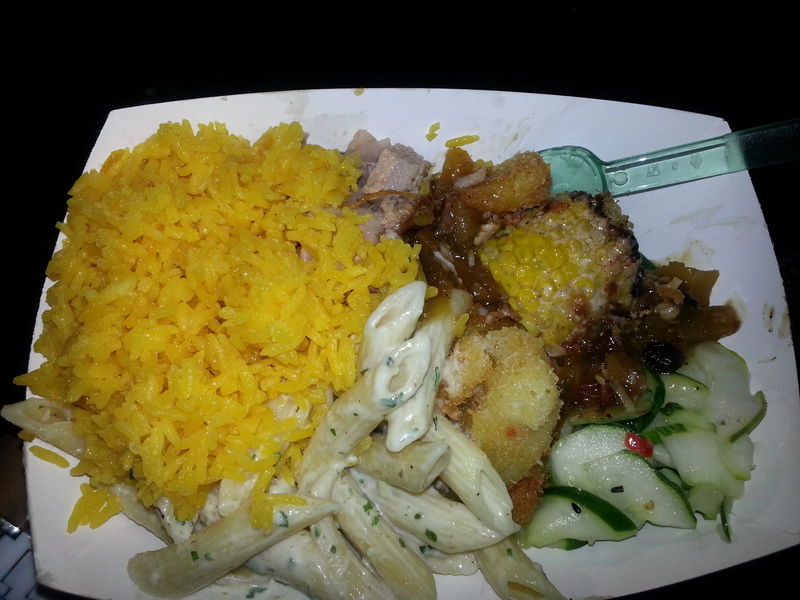 Overall, food was affordable, a lot of filling food in the range of $500-800JMD and other booths not mentioned seemed to be well supported too. So I think it is safe to say the event was a success, especially for those who went mainly to socialize, have a family night, girls’ night out and to lyme. It is a pity they had to do it with the painfully annoying, loud saxophonist in the background. Until next time!